Sunglasses, swimsuits, tank tops, and sandals are the usual accessories you think of when you’re getting ready for summer. 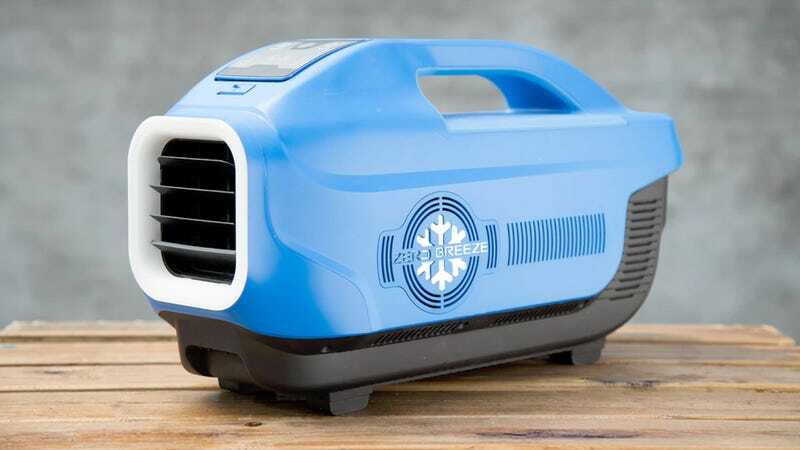 But with climate change pushing summer temps higher and higher ever year, it’s probably not a bad idea to add the Zero Breeze portable battery-powered air conditioner to that list. Unlike the portable air conditioner sitting in the corner of your bedroom that requires an exhaust vent, an outlet, and a bucket for catching drips, the Zero Breeze is as compact as a boombox and can run for up to five hours on its own rechargeable battery. The environmentally-friendly refrigerant it relies on, Dupont R-134a, is the same coolant used for mobile air conditioners attached to motorhomes and other vehicles. Unlike portable coolers that rely on a constant supply of ice, the refrigerant apparently never needs to be topped off, although depending on how long you have the unit, though, it may eventually need to be replaced. And despite the Zero Breeze’s tiny footprint, the air conditioner can cool a 50 square feet room down to 44 degrees Fahrenheit, which is actually cold enough to require a jacket and a warm drink. It seems ideal for use in tents, boats, cars, and it could very well be the perfect way to survive that steamy, scorching subway car with broken AC that always seems to find whatever platform you’re standing on. And for those times when you don’t need a blast of cool air, the Zero Breeze doubles as a lantern, a portable charger, and a Bluetooth speaker giving you even more reasons to haul it to the beach. The only catch? While climate change is real, the Zero Breeze isn’t a product you can buy quite yet. You can pre-order one, with a $389 contribution to its $100,000 Kickstarter campaign which has already reached its funding goal, but you’ll have to wait until March of next year for delivery—assuming everything goes well in production. The usual crowdfunding risks and caveats apply here, but since next summer will probably be even hotter than this one, it certainly seems worth taking a chance on this one.